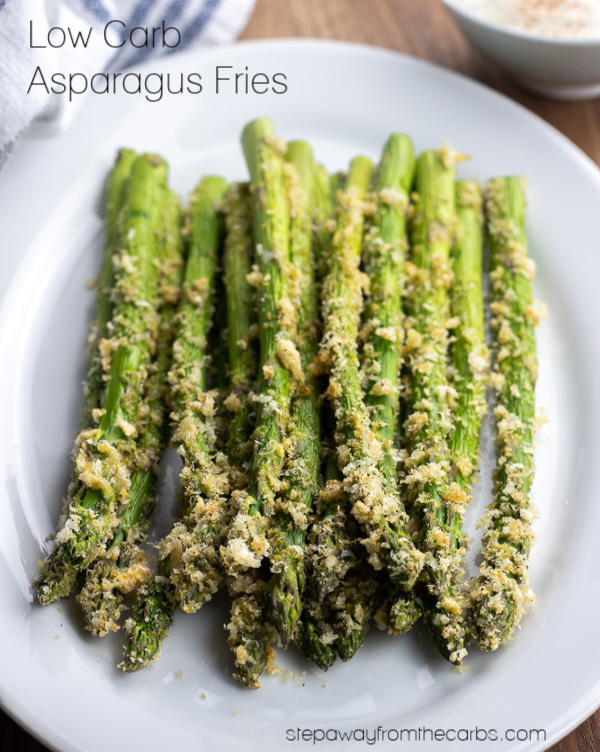 These roasted low carb asparagus fries are ridiculously tasty! And easy to make, too – watch the recipe video tutorial! 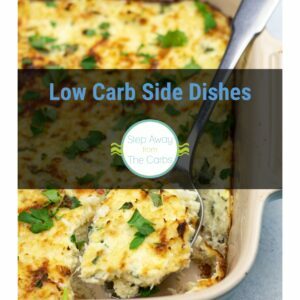 I love using crushed pork rinds as a low carb alternative to breadcrumbs – I use them for coating pork tenderloin, a topping for spaghetti squash au gratin and even to give bacon some extra crunch! 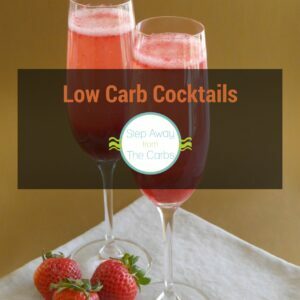 In fact, if you love pork rinds, check out these 16 low carb ways to use them! 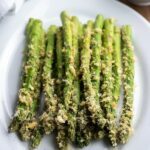 But this is the first time I have used them to make vegetable fries – and the flavors really work with this asparagus recipe! Let me know what you think! Watch the video tutorial or scroll down for the full instructions and printable recipe card! Crush the pork rinds to a breadcrumb consistency. A food processor would do this job within seconds, but until the day comes when I don’t have to do the dishes myself, I am content with placing them in a bag and manually breaking up the pork rinds with a rolling pin! The finer they are crushed the better – it takes a little while but you can do this while the oven is preheating. Add grated Parmesan and onion powder to the bag, then shake to mix. Spread the mixture out onto a plate. Beat an egg and pour it out onto a separate plate. Place a rack over a baking tray and the assembly line is ready! Snap off the woody stalk from each asparagus spear, roll it in the egg then press it into the pork rind mixture. Place it on the baking rack. Roast for 7-8 minutes until the coating is starting to brown and the asparagus is cooked. Serve as a side dish to grilled chicken or a pork chop. 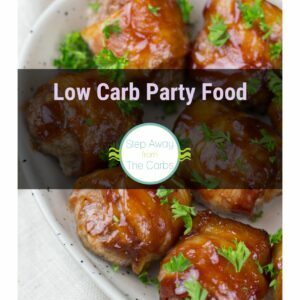 Or it works great as a party food or appetizer if you can serve it immediately – it just needs some sour cream for dipping! Place the pork rinds in a bag and crush to a fine powder. Add the cheese and onion powder, shake to mix. Pour the mixture onto a plate. Pour the beaten egg onto a separate plate. Roll each asparagus stalk in the egg, then in the pork rind mixture. Place on a rack set on a baking tray. 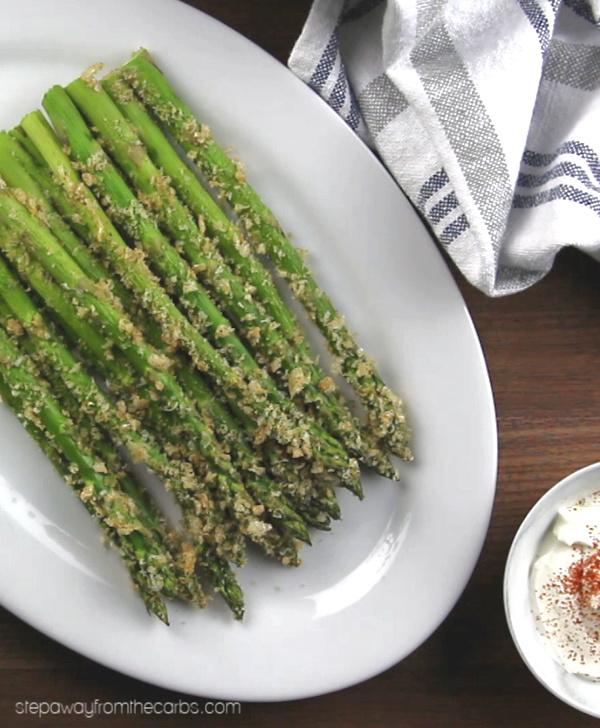 Bake for 7-8 minutes until the asparagus is cooked through. Serve immediately, with sour cream if desired.